NGO's across the Pacific, criticise The Secretariat of the Pacific Community's (SOPAC) proposal for a legislative and regulatory framework for deep sea mineral exploration and mining. 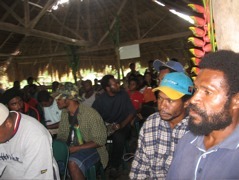 With Nautilus Mineral's Solwara 1 project in PNG scheduled to start mining in 2013, there is a growing international alliance of NGO's and civil society pushing for a halt to this latest display of greed. Wences Magun, national coordinator for Mas Kagin Tapani group in Papua New Guinea said, “Our coastal and offshore island people depend on our marine resources for survival. It is our "supermarket". Any negative impact caused to the marine environment will have detrimental negative impact on our lives and the lives of our descendants. As well as facilitating the voices of growing local community concerns about the lack of consultation by corporations, national governments and bodies like SOPAC, the NGO's are also calling for the precautionary principle to be adhered to. John Chitoa, Bismarck Ramu Group in Papua New Guinea said, “Even if good laws are in place for deep sea mining in the Pacific do we even have the human resources or the capacity in managing it. Without enforcement we end up with indigenous communities suffering like they have in PNG at the hands of the worlds largest mining companies like BHP Billiton (Ok Tedi and the destruction of the Fly River) and Rio Tinto (Panguna and the war in Bougainville).